For the third week of playing and exploring games in the studio my group was looking at internet based games. I used to play a lot of internet games when I was younger, especially Runescape but since I stopped I’ve not really played any of note or memorable. I got told about this game so I thought I’d give it a go with it claiming to be the ‘worlds hardest game’. 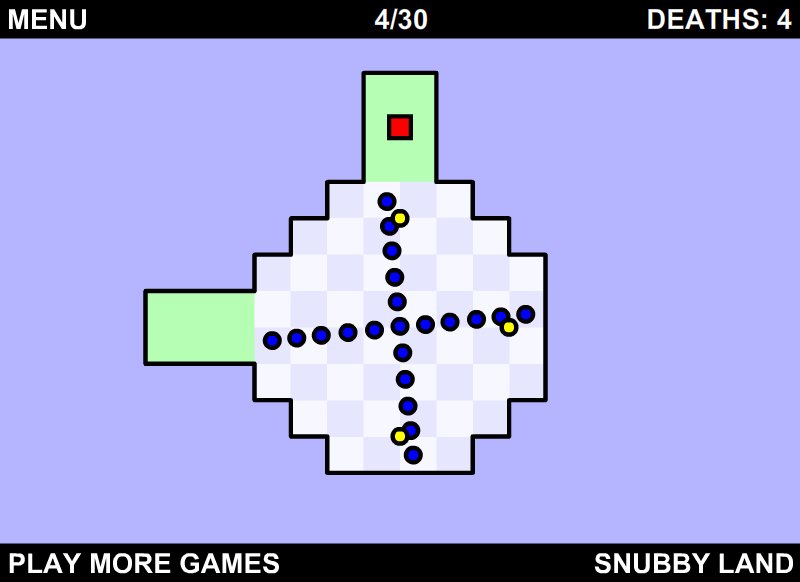 The aim of the game is to get the red square (Player) to the green safe zone whilst avoiding the blue circles and collecting the yellow circles, so it’s a puzzle game where you have to react quickly. As most internet based games the rules are very simple for the casual gamer. As the name suggests it is a very hard game, some levels I just kept dying over and over again, probably because I wasn’t patient enough and was just trying to rush. It falls into 3 of Caillois categories, I classed it as Agon because I wanted to do better then other people in the group and you have a death counter to keep track of that. Illinx because it’s very confusing trying to tell if the blue circle will hit you as they come in from different angles, skewing perspective. And it also falls into Mimicry because you have to repeat a lot of the same actions over and over again to complete a level. I would say at certain points during play I did achieve flow, but only very briefly during levels which where all about rhythm. I’m not really sure where I was in the flow diagram for most of my play time, I found myself very frustrated with the game. If I had to put myself into a section I would say anxiety because my skill was low and the challenge was very high. Overall it was a good game to play and had a lot of the elements you expect from an internet game. This is a game that I used to play so I thought I’d give it another go now because I remembered enjoying it. It’s a side scrolling game where you use ‘A’ and ‘D’ to move left and right, ‘W’ to jump, ‘S’ to crouch and then moving the mouse moves the crosshair with the left mouse click to shoot. Again quite simple controls, only takes seconds to know every control in the game. It’s quite a brutal game about killing demons and it’s about quick reactions and good aiming to complete the game. I wasn’t too sure if this game fell into the Agon category or not as there is no score or multiplayer but you are trying to beat yourself by getting further then you did previously and to get further then friends. It does fall into the Mimicry category though as you are playing as a priest killing demons. There is no chance involved in the game as the enemies always appear at the same time in each section, they aren’t random. I would say I was in the control section of the flow diagram because even though I died quite a few times I kept doing better each time and then eventually completing the game.